By Jake, piloting a Suzuki Jimny. On a frosty -3, clear sunny Saturday morning, those of us who travelled to Tekapo the night before from Queenstown, Wanaka, and as far as Invercargill (cant blame them for wanting to get out of there), met up with the rest of the drivers in the town centre. 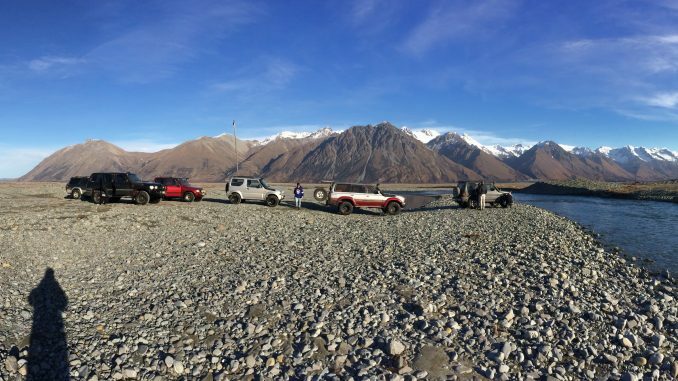 7 trucks in all headed for the track entrance at the mouth of the Macaulay river at the northern end of Lake Tekapo: a Pajero – with Nick the trip leader behind the wheel, two 80 series Landcruisers, a Jimny, a Vitara, a Surf, and a 70 series cruiser. We stopped to air down the tyres, then continued onto the river bed, through a couple of water crossings, then up the Godley Valley, taking in the spectacular views of lightly snow-capped mountains on either side. There was no snow on our level at all, although there were a fair few frozen over puddles from the morning’s frost and it was hard to distinguish a set track through the riverbed. Jokes were made about Pajero vs Landcruiser-made tracks (of course the Suzuki drivers were thinking, “When is the actual 4wding going to start”) but we made good time to the Red Stag hut for an early lunch in the sun. Kate & Scott stayed behind at the hut while the rest of us headed further up the valley, where we decided to get a break from the bouncing of the trucks, get some fresh air and walk the last 15 minutes to look over the wee lake at the end of the valley. We then headed back down the valley, Kate & Scott joining the convoy as we passed the hut, taking another route over the rocks and the occasional water/mud crossing. Nick and his passengers, and Scott & Sue in the Surf, were only along for the day, so they continued back to Tekapo. The remaining 5 trucks carried on up the Macaulay Valley, in search of the Macaulay Hut where we were to spend the night. Again there was no snow – only the odd bit of ice remaining in the shadows along the way. It made for a quick, trouble-free drive. The hut came into sight, and we could see two trucks already there. Two couples, one with a wee girl, were all from Christchurch on a hunting trip. There were plenty of bunks left and those who decided to make the most of it claimed their beds, while some decided that their trucks were more comfy. The fire was lit, roaring away and was put to good use in cooking our dinners, including Kate’s huge pot of chilli con carne which was polished off by Matt after some encouraging words were exchanged. A few card games were played, and many good yarns were told to top off a fantastic day. We had a relaxed start on the Sunday morning with a cooked breakfast before cleaning up. At a warm 5 degrees there was no frost, the sun was out, but the wind had picked up. We posed for a group photo outside the hut, then made our way back down the valley. It was a problem-free drive back. 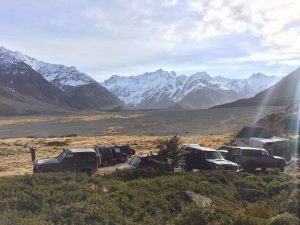 We passed another group of around a dozen trucks heading up to the Macaulay Hut for the night – lucky buggers not having work the next day! Around midday we made it back to the Tekapo town centre, where we pumped up our tyres and had a bite to eat and a coffee at a cafe, before saying our goodbyes and heading back home. All in all it was a great weekend – bring on the next one!